In an earlier post, I mentioned some of the books I’m looking forward to reading this summer. Here’s an update on my summer reading. Want to spend an enjoyable week? Pick up Tim Wohlforth’s new book The Pink Tarantula. It’s a series of nine connected short stories about an unlikely pair of detectives. 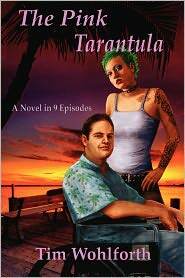 Tom Bateman is a California private investigator in a wheelchair. (I had originally typed “confined” to a wheel-chair, then considered “wheelchair-bound,” but realized that Bateman is anything but confined. Think of him as Hammett’s Continental Op in a racing wheelchair.) Bateman was injured in Vietnam and he has a postwar outlook, with plenty of countercultural connections and no illusions. Bateman’s trickster assistant is a woman named Henrietta (really). She calls Bateman “Crip.” I think of her as Lisbeth Salander, without the computer skills or self-control (or you could think of Salander as a blend of Henrietta and Carol O’Connell’s character Kathy Mallory). Often, it’s Henrietta, with her drug dealer boyfriend, who brings the trouble to Bateman’s door. I have to admit, I’d be less tolerant of Henrietta than Bateman is. I had intended to read a story a day, but got hooked and kept reading ahead. Wohlforth offers muscular prose (with, like Bateman, a lot of upper body strength and surprising agility), action, noirish California settings, and even at one point an homage to Dashiell Hammett. And the title story is based on a true incident, a 1997 murder at a San Francisco hair salon. Wohlforth, by the way, is a Pushcart Prize nominee and a devotee of short form writing with over 70 short stories to his credit. His last novel Harry was set in the kind of mythical Jefferson City, an artsy Oregon town with a theatre festival. He’s also written nonfiction about cults, and there’s a solo Bateman story in The Pink Tarantula about cults too. Literary Ashland is filled with serendipity. I began reading Forgetting English on the same day that I finally saw The Language Archive at the Oregon Shakespeare Festival. The Language Archive is Julia Cho’s play about the loss of language and the way we lose interpersonal language when give ourselves over to other projects (yes, I know, I’m guilty). In the play, English is the language of anger and half-truths and the ending question touches on the emotional value of ambiguity–a hug that mean both the same thing and different things to the main characters. 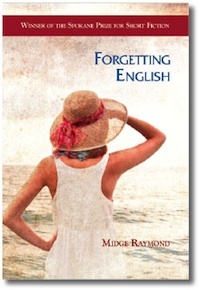 Reading Midge Raymond’s Forgetting English in the context of The Language Archive helped me to see the stories as about our limited vocabulary not just as travelers but as individuals—siblings, spouses, lovers, friends, and colleagues. Forgetting English is a collection of poignant stories with realistically drawn characters and detailed, exotic scenes: Melanie is in Tonga after losing her advertising job, Dan and Julie are in Tokyo after losing a baby, Deb in Antarctica fails to save a suicidal tourist, Sue learns about her husband’s affair on an anniversary trip to Hawaii, Karey, a nanny, nearly losed a child to the Pacific riptides, Lise lets her dissolute brother find his own way in Australia, and in the title story Paige in Tapei reclaims her life after a suicide attempt. Characters face adversity—death, defeat, displacement—and they gain insight from ephemera of life a misplaced ring, a standby ticket, a jade pendant, or someone else’s phone message. Forgetting English was the perfect complement to The Language Archive. Midge Raymond’s Forgetting English received the Spokane Prize for Short Fiction, and her work has in TriQuarterly, American Literary Review, Indiana Review, North American Review, Bellevue Literary Review, the Los Angeles Times magazine, and the Bellingham Review. She has been nominated for three Pushcart Prizes. I’m reading Stylized by Mark Garvey. As the subtitled says, it’s “a slightly obsessive history of Strunk & White’s The Elements of Style.” It’s more than that though. It’s a biography of Cornell professor William Strunk and (his student) New Yorker writer E. B. White. I should disclaim. In high school I was very taken with The Elements of Style, but eventually I soured on it. I came to prefer James Sledd’s wonderful appendix to A Short Introduction to English Grammar and Joseph Williams’s meaty Style: Toward Clarity and Grace. And I’m endlessly annoyed with nostalgists who yammer that “All you need to do to get students to write well is have them read Strunkenwhite.” I should confess too. My most notorious typo was referring to Strunk and White as Stunk and White. And it was a typo. I swear. All that said, Mark Garvey gave me a new appreciation for the little book and for the way in which it is both a product of and a reflection of New Yorker style and waspy noblesse oblige. He tells the wonderful tale of how the book came about, quoting from the correspondence between Macmillan editor Jack Case and E. B. White. The correspondence between Case and White is literate and even charming. Garvey fleshes out the book with comments from other writers (Ian Frazier, Adam Gopnik, Frank McCourt, etc.) and with the correspondence between White and his readers. Most enjoyable, for me, were the depictions of Strunk and of White and the snippets from other writers—Gopnik, Frazier and the like. I especially enjoyed reading about White’s idyllic Maine existence and Strunk’s trip to Hollywood as a Shakespeare consultant. Less enjoyable was the author’s whining about English Departments and his lumping together of descriptive linguistics and post-modernists. And I would have enjoyed a bit more fleshing out of the discussion of the updating of the eternal truths of grammar from edition to edition. But I’ve got a new appreciation for Strunk and for White and even for Strunkenwhite. I’m reading Mike Rousell’s Sudden Influence: How Spontaneous Events Shape Our Lives . It has been on my mental I-should-read-this list for a while, until one day when I ran into Mike in the restroom. Literally. I was walking out and he was walking in and, as I turned away to watch the trajectory of my paper towel toss, we collided. I pulled my elbow out of his solar plexus, he made a hockey joke, and I rushed off to an appointment. The next day I picked up a copy of Mike’s book, pleased with the irony that a spontaneous event would guide my behavior. Rousell (now that I’m talking about the book, we’re on a last name basis) is a psychologist and counseling professor at Southern Oregon University. But he doesn’t write like typical professor and Sudden Influence doesn’t read like a dissertation. It’s academic in the good sense—well supported and having a comprehensible theoretical framework while for the most part avoiding a professorial style (of nominalizations, convoluted sentences, technical jargon, intrusive overcitation, and so forth). The basic idea is that at emotionally charged instances our otherwise rigid frames of mind become open to new ideas and perceptions. Often such new ideas are about our potential and thus guide our lives. There is some discussion of the rigidity of our intellectual frameworks, how we rationalize new experiences to frames, and how that rigidity can lessen. Sudden Influence certainly caused me to rethink the cliché of the teachable moment and the advice that “if you don’t have something good to say, don’t say anything at all.” Another effect is that readers will think about the sudden influences in their lives. I won’t bore you with mine. The book is directed to teachers and counselors mostly, but there are some intriguing ideas for people interesting in cognitive science—potential connections with the linguistics of George Lakoff and others and even to the Sapir-Whorf ideas or Elizabeth Loftus’s work on courtroom testimony. And for those interested in rhetoric, the book raises the question of how sudden influences might be a tool to deal with the conceptual bias and echo chamber reinforcement that we find in much public policy debate. Thanks for posting all these thoughtful reviews (and thanks especially for your generous review of Forgetting English) … now you’ve given me even more to stack onto my own toppling summer reading list!